A SCHOOLGIRL is proving an inspiration to fellow pupils after making waves in the world of judo. Ten-year-old Charlie Whitfield represented Begbrook Academy at this year's Western Area Regional Schools Judo Championship. Having won gold in 2016, Charlie was determined to stand at the top of the podium again this year. With steely determination, the Year 5 pupil won her three contests with spectacular finesse and once again took the top spot. Despite winning gold within her combined year group of Year 4 and 5, Charlie is not eligible for this year's British Schools Championships as the minimum entry is Year 6 and above. However, Charlie is hoping to win gold for the third time in 2018 which would open the door to her qualify next year. Charlie's success is even more incredible as she has only been competing for four years. Later this year she will compete in and around Europe, including The Netherlands, Bosnia, Croatia and Portugal, for her club, Bradley Stoke Judo Club. Further triumphs include taking silver in The Hague, Holland at the IRJT Adidas Championships in November. Miss Thomas, Charlie’s teacher, said: “The whole class are really proud of Charlie and her achievements. "Charlie has managed to compete in all these competitions and managed to maintain a high standard in her academic work. 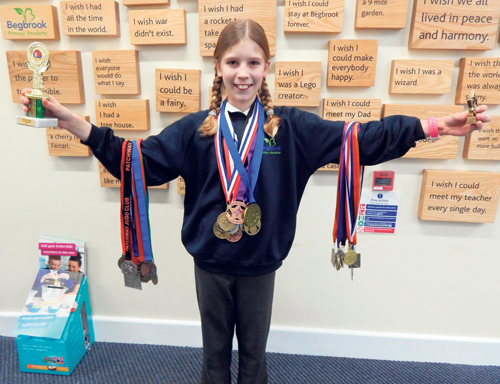 "Charlie inspires all of our class and younger children by going off to these competitions all over Europe and bringing back medals. "And even if Charlie doesn’t win Charlie bounces back and shows her resilience to the rest of the class."